Multiple sources tell NBC 4 New York that video from a Department of Transportation camera shows the school bus filled with fifth-graders in Thursday's deadly wreck in New Jersey making a sudden U-turn in a median. Chris Glorioso reports. Multiple sources tell NBC 4 New York that video from a Department of Transportation camera shows the school bus filled with fifth-graders in Thursday's deadly wreck in New Jersey making a sudden U-turn in a median. 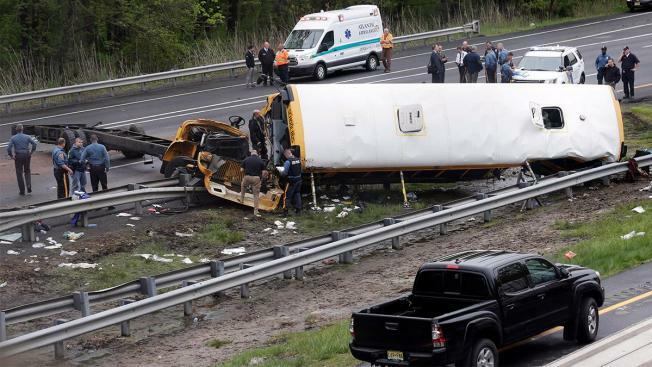 The development comes as investigators probe the cause of the crash, which killed a 10-year-old student and a teacher after the full-size school bus collided with a dump truck on Route 80 near exit 25 in Mount Olive Township. The bus, which was carrying 38 students and seven adults from East Brook Middle School in Paramus, was heading to a class field trip to Waterloo Village, a historic site in Stanhope. The student who was killed has not yet been identified. The teacher has been identified as Jennifer Williamson-Kennedy, whose husband issued a heartrending statement late Thursday. The rest of the people on board were injured, some critically. A dump truck traveling in the same direction slammed into the bus as it suddenly appeared in front of him, the sources said, citing DOT footage. The investigation is still early and no conclusion has been reached. The school bus driver is still being treated for injuries and has not yet been interviewed. The injured were transported to six different hospitals and some were undergoing surgery. The crash was so severe some injured children climbed through windows and the roof's emergency exit to get to safety. There is no federal requirement for seat belts on full-sized school buses, but six states, including New Jersey, require them. An 11-year-old boy sitting in the fourth row of the bus told News 4 New York, "I heard like a scraping noise and then the bus tilted over, and a lot of people were screaming." Students on the other two buses taking part in the trip were told they had to leave 10 minutes after arriving because of a storm, and only learned of the accident when they arrived back at school. They were then reunited with their families. All school trips for the rest of the year were canceled. School leaders decided not to cancel classes on Friday, saying the student body should be together to grieve. "We thought it was just a drill and people were joking around," student Alejandro Garcia said. "Stuff started coming in. We gathered around two students whose brothers were on that bus... It was just horrible what happened." No additional details on the children or any injuries were available. The area of exit 25 on Route 80 where the crash happened was closed for the majority of the day. It wasn't until just before 9 p.m. when all lanes had reopened as cleanup crews loaded the mangled bus onto a flat-bed truck.